“The awakened heart is like a lantern. “We are candles, lit by the one great flame. The breath of life does not extinguish us; on the contrary, it only serves our flame to blaze brighter. Here, in the temple of one love, there is no flickering or smoke to our flame. We are natural in our purpose, simply to bring the warmth and light of love to life. We dance, though we are stillness. We are on fire, though we do not burn. There is a flame that must be safeguarded. In truth, it can never be extinguished. It is the light that never goes out. Even with such enduing power, our recognition and respect of this flame is essential to human development. This flame is holy and lies within each human heart. When the flame is recognized for its worth, it ceases to flicker and smoke becoming very still. In the stillness, the light can fulfill its destiny to shine brightly so as to reveal every path, absolutely clear and without wavering in the fluctuations of fear and attachment. Desire does not have to be a hindrance on the path. It can show us our passions and help us to find our purpose. However, the attachment that can come with desire, the belief that is can be sated only with one particular person, one set of circumstances, can cause us to stop looking at what the light is revealing to us – the way forward on our path in the here and now – and instead try to forcibly conjure the shadows to become what we imagine they should be. When we stop seeing life as it is, showing up for us every moment and engaging with it as it is, we can become careless with the light of the heart. Our huffing and puffing to force what does not need to be forced can cause the heart light to flicker and waver. This can make our way seem uncertain, and doubts can crowd in upon us as the light is compromised in its purpose. We forget to trust in what is because we get caught up in attachment and fear surrounding our desires. Rather than letting life move us, we try to move life. There is a way forward on your life path that needs to be seen by you now. It will be helpful for you to have that clarity and that certainty. You might have already caught a glimpse of it but be doubting your vision or yourself. 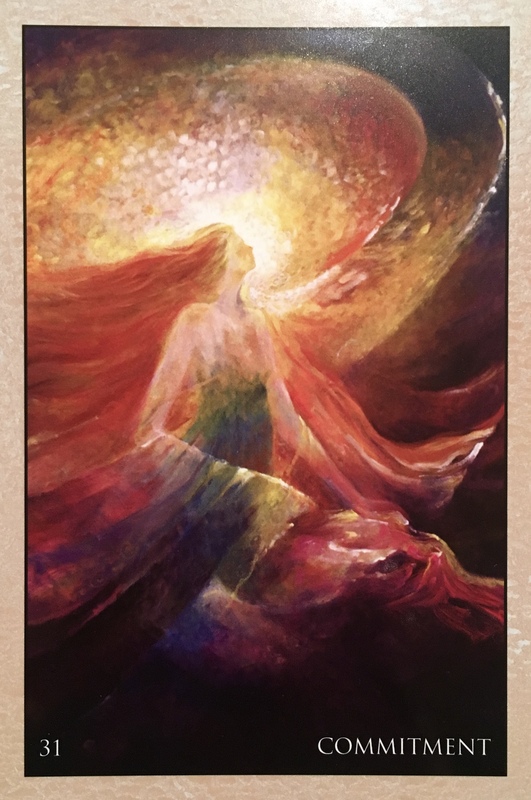 This oracle comes as a reminder to you – don’t doubt! What you are feeling, deep within the passionate love of your heart light, is true. It is real. You are being led into it by the progress of life itself. You must trust in this, even if it seems at times as though you are being led away from the vision. Life operates according to a genius that is beyond a linear approach. It is to be trusted rather than understood. There is enough challenge inn the personal transformation being asked of you to simply take the steps. That is more than enough! You do not have to also create or control the terrain, nor determine the map for the journey. You simply need to take each step that presents itself to you in each moment. This card is about commitment, but not commitment as we typically understand it. This is not a just a message about giving ourselves over to another; it is certainly not a message of compromise. This is a message of commitment to yourself first; your life and your journey. It is a commitment to finding answers, to decoding ancient mysteries and to accessing ancient wisdom. It is a message of commitment to our life purpose, alignment to our Soul and connection to the Divine. Only then are we able to move forward in our relationships into loving and sacred union. Make a commitment to spend some time alone. Being in the present moment, comfortable in your own presence. This is not a time to rely on others to guide us, but a time to find the answers we seek within ourselves. It is a time to let go of the old ways of seeing ourselves in the world and make space for something beautiful and expansive and new. It is a time to trust in ourselves, have faith that we are capable and be curious about why exactly we are here, now. It is a time of receptivity and embracing possibility. It is committing to this next stage in our spiritual development, another welcomed rite of passage on this amazing experience we call Life.